Friends coming over for the Football party this weekend? Chili is a must! Cook it the day before, it always tastes better the next day. Add chili to your next BBQ, serve with grilled sausages or hot dogs. 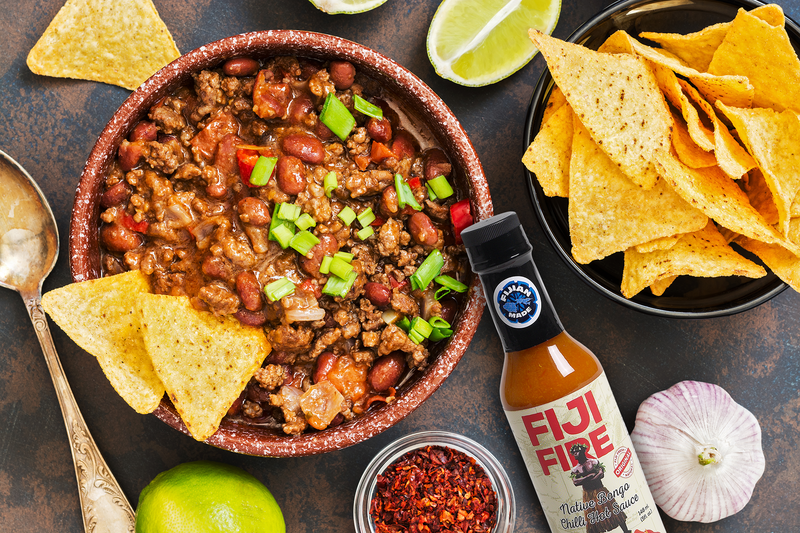 Top the chili, with Cheddar cheese, corn chips and more Fiji Hot Sauce for extra flavor and texture. Cook first 4 ingredients in a large skillet over medium-high heat, stirring until done. Place mixture in 5-quart slow cooker; stir in beans and remaining ingredients. Cook at HIGH 3 to 4 hours or at LOW 5 to 6 hours. To thicken: Mix together 1 Tbsp (15 ml) cornstarch or flour with 1 Tbsp (15 ml) cold water to add to the chili. Next Multiflora Honey Valentine’s Day Truffles to Woo Your Loved Ones!